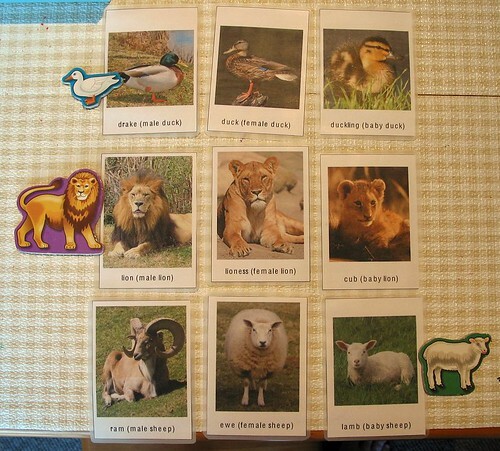 This wonderful idea was found on Montessori for Everyone‘s blog and so were the initial animal families from the very generous download section. You can find the animal families under the Cultural Materials section. Using this initial group as inspiration I am now in the process of identifying and creating my own additional family groups so we can keep expanding Little Miss O’s vocabulary and knowledge of the animal world. This was actually one of the first activities that I created for her, and using the Montessori principle of “follow the child”, I was following Miss O’s love of all things animal. Then a little while later she came up with her very own variation. She wanted to add her animal fridge magnets into the mix, which she did by pairing up the magnet with the most appropriate animal image. This Miss O variant has had me finding new animals for the remaining magnets. 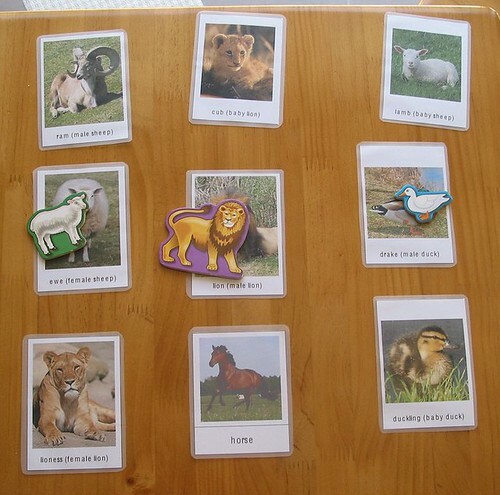 They are currently waiting to be laminated and cut out to join her growing stash of animal cards. And to follow on from all of this is Miss O’s love of sitting by me at the computer constantly asking me to find pictures of elephants, rhinos, giraffes, and any manner of other animals. This little wander around the internet in search of wild animal photographs led me to my next recommendation – National Geographic has a great website for kids. Loads of pictures and information, as well as games and activities for older kids. A great resource for teaching (or learning if you have an animal lover, but you didn’t pay attention to all those David Attenborough documentaries) and generating your own activities.